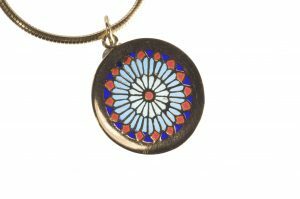 Miniature stain glass window effect in jewelry. Frames of metal holding enamel, with no backing, thus allowing the light to come through. Developed in France and Italy early in the 14th century. There are several methods of plique à jour. This jewel of plique a jour is a method of pierced metal. Most artists will use this method with the aid of Klyre Fire, a glue substance, to help hold in the powdered enamels before firing. This jewel is created in 18k gold sheet of 22 ga. The use of gold gives you more strength and allows you to create jewels in a thinner gauge. The Bird of Paradise Pendant is more involved. I want to show where you can go with pliqué a jour. Here I have chased the Bird of Paradise in 18k gold sheet of 16 ga. and cut away the negative space. I used 18k flat wire to make the leaves and soldered them in place with hard solder. With such large open spaces the use of foils aid in holding the enamel in place, until fired, then the foil is removed. The stone setting took place before the enameling. 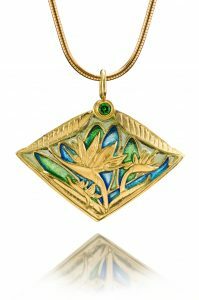 Less worry of cracking your enameled piece. 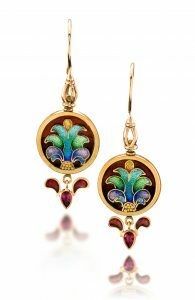 This is a pair of cloisonné earrings with a drop of plique à jour leaves and a ruby. I would never get a stone cut like this much less be able to afford it. The leaves above the ruby are made in 18k gold, 18 ga sheet pierced and sawn out, then filled with enamels. Again foil is used to support the enamel while firing. The enamels in this case were laid in after the ruby was set. 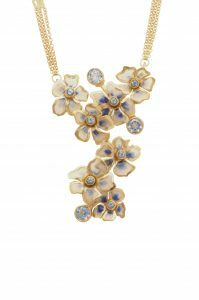 This enamel jewel of plique a jour is made of 18k gold sheet. The pedals have been sawn out and formed in a dapping block. The opens were pierced and filled with enamels using foil for support. And assembled after firing all the enamels. The stones are fabricated on screw post and allows it to be assembled in such away the pedals all turn. Millenet in Enamelling on Metal states to use larger granules of enamels, consistent in size for plique to acquire a clearer transparent. Also he puts the Klyre Fire against the cell wall then adds the enamel. Another point is to use soft firing enamels= higher expansion rate enamels, which mean these enamels melt sooner than others allowing it to fuse faster and not fall through the openings. If necessary to use Klyre-fire to hold the enamels in the opening while firing, use one part klyre-fire in 5 parts water in your enamels. After washing your enamels pour off all the water then add the Klyre-fire mixture to the enamels. Too much Klyre-Fire will cloud your enamels, so pay attention as the day goes, the water evaporates and makes the mixture stronger of Klyre-Fire, so add a bit of water though out the day. The use of a consistent gain size gives the best clarity but also using a smaller grain size can be used such as 150 mesh, as it is lighter and easier to fill the openings without falling through. It is a bit tricky, but you are making a water bubble with your brush in the opening. I place my brush parallel to the surface of the metal and opening, and just touch the edge with the brush and move it across the opening, this usually makes a water bubble. There is enamel on your brush at this time, and a good bit of water. Fire the enamels just to orange peel until you have the cells filled with your enamels, then carefully fire to maturity. This way the enamels are less likely to fall through. You mentioned, that you soldered parts before enameling. What kind of solder would you use, which will not destroy in the kiln for silver or gold? I often see soldered parts in different implementations, especially in Russia when they use Minankari technique – making rings and other things. I also see plique a jour Russian enamels soldered from tiny wires similar to filigree (versus piercing) . I know how to solder filigree, but traditional filigree solder will not survive the kiln temperature. Using very hard solder would be a risk to melt wires when soldering… Could you share your experience, please. One this one jewel I needed to add the leaves and used 18k hard solder. It melts at a higher temperature than what I fire enamels…1420 F. On the champleve demo I showed I did the same thing soldered with SS hard and fired at a lower temp then the solder flows. I will definitely contact Diane. Her work is very close to Russian plique a jour. Couple of more quick questions. Will hard solder create a danger of oxidation and changing enamel colors? There is an eutectic solder for enameling (OttoFrei has it), do you have experience using it? These tiny flowers are pierced and the walls are thin. Do they warp when you heat them in a kiln? You mentioned, you were using foil to support. What kind of foil? Thank you so much, I love your blog. A lot of good information here.